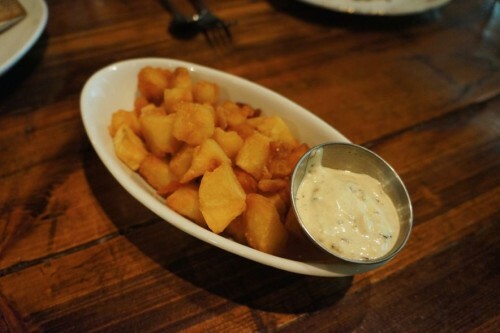 I had a great meal at Skin + Bones (@skinandbonesTO) a few years ago when they initially opened. It’s been a while but I finally returned last week and was reminded of what a great neighborhood spot this is. Our group of four arrived on a Friday evening to a packed restaurant which is quite impressive given its size. Skin + Bones occupies an enormous space on Queen St, just east of Carlaw. Despite being dark and having an industrial feel to it, there’s a nice coziness to the atmosphere. Since my initial visit, the chef has changed (more than once, I believe). But after our recent meal here, the food still seems to be going strong. The menu consists of dishes featuring local and seasonal ingredients. Appetizers range from $5 for marinated olives/peppers to $18 for a cheese board while entrees will run between $20 for pasta to $27 for a heartier meat dish. They also offer a Chef’s Menu (“Let Us Feed You”) for $38 per person. You can also take advantage of their Buck-a-Shuck Sundays from 5pm to 10pm which includes $5 beer and $7 bubbly. I’ve also heard fantastic things about their brunch offerings, which I’ve yet to try. 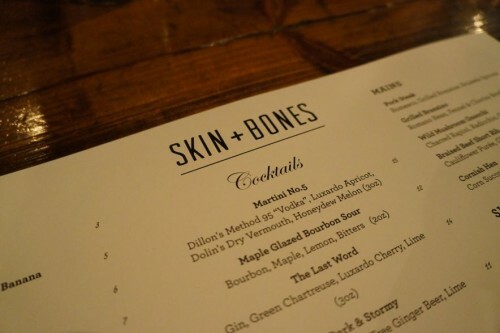 As far as beverages go, Skin + Bones has a nice wine and beer selection. However, if you’re looking for special cocktails, you won’t find them here. Their cocktails are all classics which can be found anywhere else. 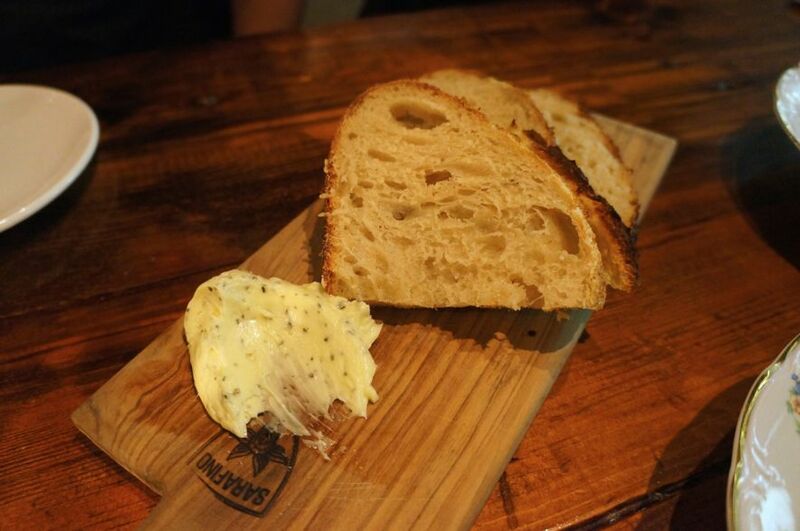 We started our meal with an order of House Made Sourdough – with rosemary butter ($3). Soft and fluffy with a nice crust, this sourdough hit the spot. And that rosemary butter…to die for! Up next was the Pork & Ricotta Meatballs – with soft polenta ($13) which comes with three meatballs. The meatballs were very solid. Nothing mind-blowing but still delicious. 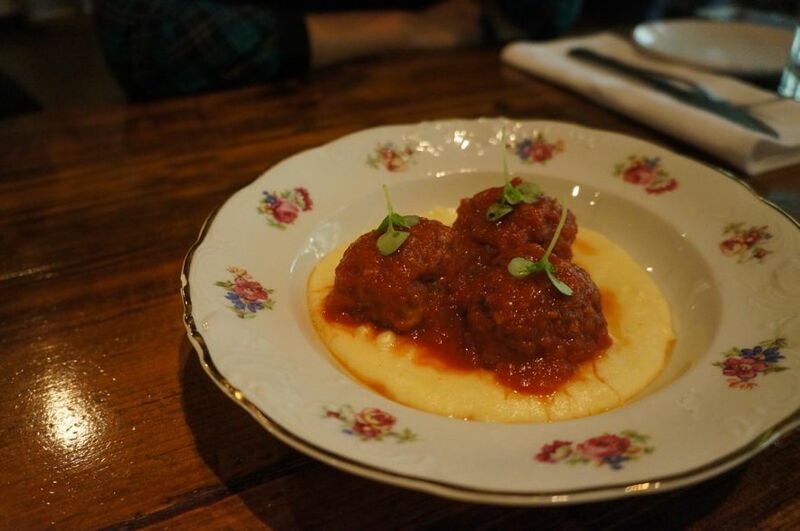 The accompanying polenta soaked up the tomato sauce nicely and made for a nice starter. 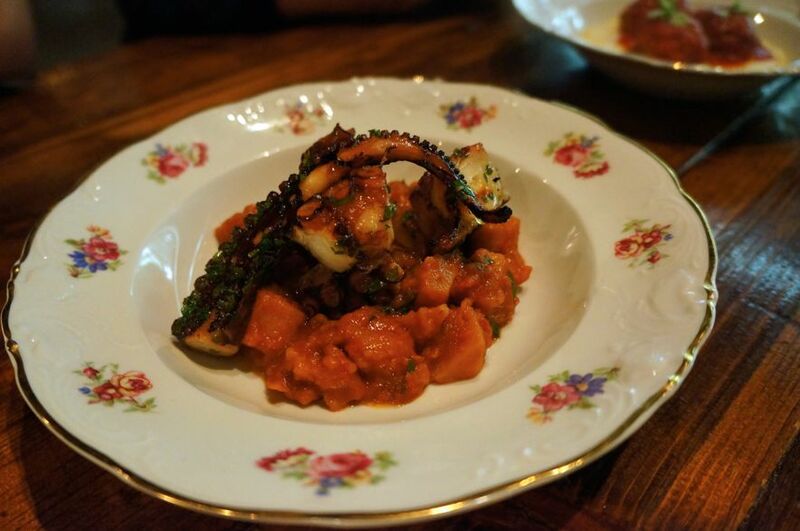 Another appetizer we shared was the Grilled Octopus – with paprika stewed potatoes ($18). The octopus was perfectly cooked – incredibly tender bites. The octopus was definitely the star of the show as the stewed potatoes really weren’t anything to write home about. Two of us ordered the Wild Mushroom Gnocchi – charred rapini, radicchio, grana padano ($20) for our mains. As a heavy meat-eater, I should’ve known better than to go the vegetarian route. Neither of us enjoyed the dish. We were expecting a pasta dish that was more…well, for lack of a better word, “mushroom-y”. The bitterness from the charred rapini overpowered the entire dish. That’s all I could taste in each bite, which muted any flavour coming from the mushrooms. 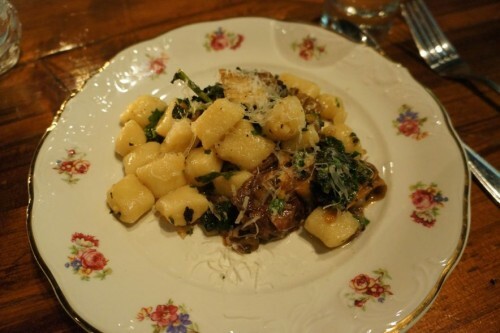 As for the gnocchi itself, I found it a bit too mushy. Next time, I’m sticking to the meat. 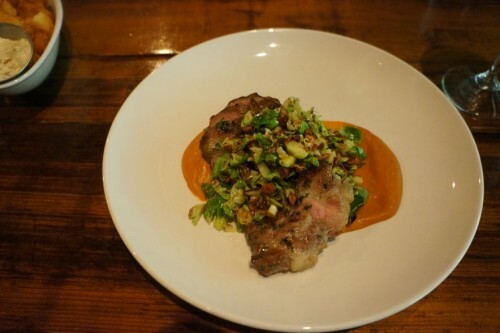 I was a little skeptical when Mike decided to order the Pork Steak – romesco, grilled romaine, Brussels sprouts as I was afraid it would come out dry. Thankfully this wasn’t the case. It was cooked beautifully and the romesco sauce and Brussels sprouts complemented the pork nicely. 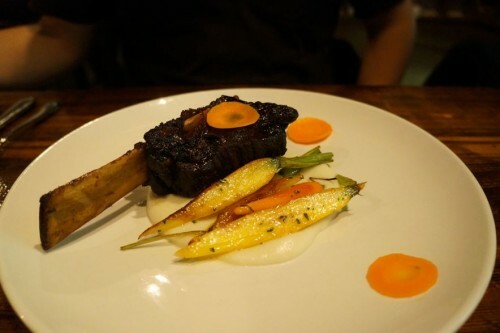 Joe ordered the Braised Beef Short Rib – cauliflower puree, glazed carrots ($27). I tried a bite of it and found it to be delicious. A warm and comforting dish that’s perfect for the cold weather. You definitely have to order the Crispy Fried Potatoes – ranch mayo ($6) for the table. They’re extremely crispy, as advertised, and well-seasoned. Dip ‘em in the delicious ranch mayo and I guarantee you’ll be addicted. 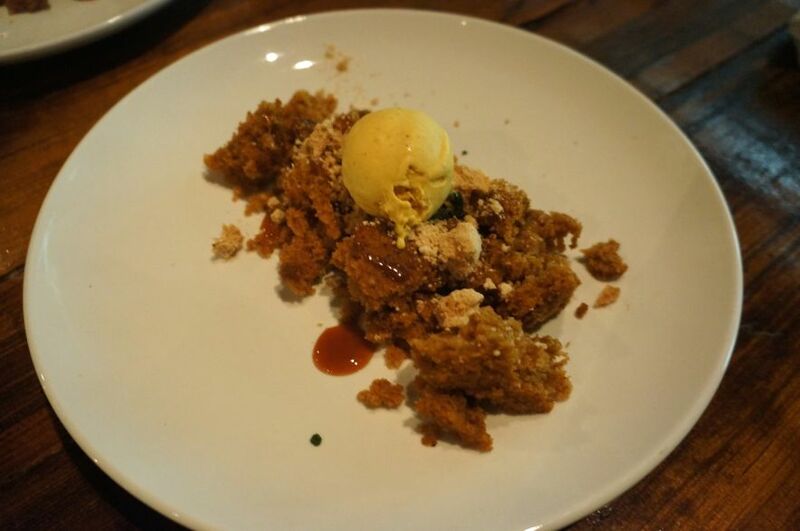 We ended the meal with the Pumpkin Cake – cinnamon meringue, bourbon caramel, pumpkin ice cream ($7) for dessert. It isn’t really fall until there’s pumpkin on the menu, right? The cake was soft and moist, and I loved the combination of all the elements – crunch from the meringue, sweetness from the caramel and coolness from the ice cream. Overall, we had an enjoyable meal at Skin + Bones. I wouldn’t say it’s a must-visit for those who have to make the trek out to Leslieville, but if you’re in the area, it’s well worth a visit!